J. Huang et al., “Adipocyte p62/SQSTM1 suppresses tumorigenesis through opposite regulations of metabolism in adipose tissue and tumor,” Cancer Cell, 33:770–84, 2018. Obesity is second only to smoking as the biggest preventable cause of cancer in the US. It’s linked not only to cancer incidence, but also to disease progression and outcome. So understanding how fat tissue communicates with tumor cells in vivo has long been a goal for cancer researchers. 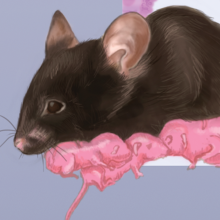 To do that, most groups “give mice a high-fat diet and see how the tumor grows,” says Jorge Moscat, who studies cancer metabolism at Sanford Burnham Prebys Medical Discovery Institute in La Jolla, California. But this diet triggers multiple, confounding effects on mouse metabolism, he adds. He and his colleagues decided to try another approach: selectively knocking out the gene for an autophagy-promoting protein in the adipocytes of a transgenic mouse model of prostate cancer. Moscat and his team knew from previous studies that noncancerous mice whose fat cells lacked this protein, called p62, were obese and insulin resistant, even when they ate normal diets. The researchers wanted to see what effect, if any, the alteration would have on cancer cells. CANCER PROMOTERS: To investigate how fat cells communicate with tumors, researchers knocked out the protein p62 in adipose tissue of a mouse model of prostate cancer (1). 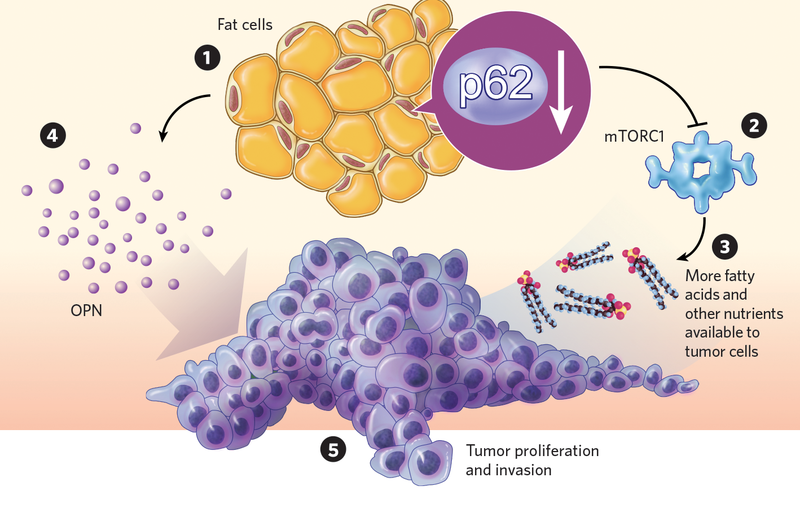 The lack of p62 inhibited the activity of the metabolism-regulating mTORC1 complex (2) and reduced the metabolism of fats in adipose tissue (3), leaving tumor cells with more nutrients at their disposal. p62 deficiency also triggered the secretion of osteopontin (OPN), (4) a protein that promotes tumor proliferation and invasion (5). 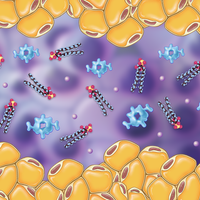 Compared with control mice, p62-deficient mutants grew more tumors and showed higher rates of metastasis, confirming the protein as a tumor suppressor. 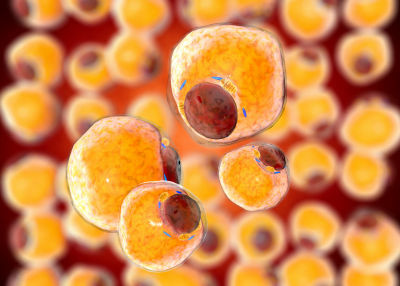 Researchers found that the p62-deficient animals’ fat tissue had reduced activity of the metabolism-regulating protein complex mTORC1, and their adipocytes metabolized fewer fatty acids. “That makes a lot of nutrients available for the tumor,” Moscat explains. The mice’s fat also showed elevated production and secretion of a protein called osteopontin, which promotes tumor proliferation and invasion. 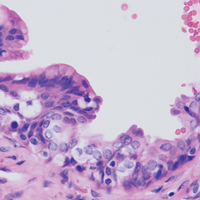 This result was mirrored by the team’s clinical data, which revealed a link between osteopontin expression and poor prognosis in patients with prostate cancer. Mikhail Kolonin, a biologist at the University of Texas Health Science Center at Houston who was not involved in the research, says the study “provides some important insights into the mechanisms” of fat-tumor communication. However, in the mouse model of prostate cancer the team used, called TRAMP, the cancer is possibly “too aggressive,” he notes. Indeed, in this study, p62-deficient TRAMP mice didn’t show their usual obese phenotype—likely because of the physiological burden of the tumors themselves. 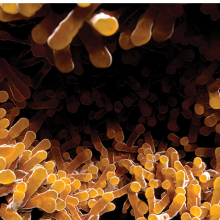 This means the findings’ relevance to obesity may be limited, he says, adding that a better understanding of osteopontin signaling is necessary to piece together how adipocytes promote cancerous growth.